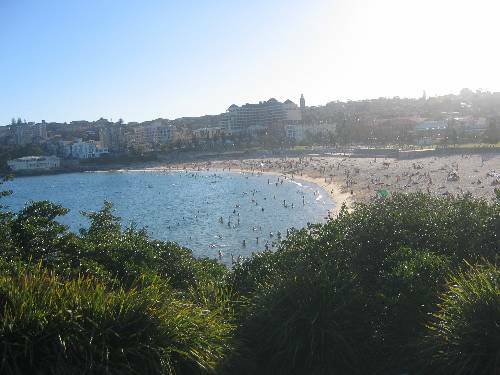 Blog from Coogee Bay, Sydney, New South Wales | Where's Suzie? Just about got through the first week of 2005. Was thinking of coming home but then the sun came out so I've decided to stay - so fickle. The last few days (days 44-50 if my calculations are correct) have been spent organising myself and spending some time in the sun. Went and got myself a proper backpack, bought my bus ticket for my east coast trip (valid for 1 month where I can hop on and off where I like up to Cairns), sent a load of stuff home (including presents this time), updated my website and tried to get in touch with Aarons mates (unsuccessfully). Other than that I stayed for a bit in some really nice apartments right in coogee that had a swimming pool so along with that and a couple of walks up to Bondai Beach I've been finally getting a bit of exercise (totally shattered now though!!). The walk to Bondai is around 5km (or maybe more with the cliffs and bays you have to negotiate). A really pretty walk as some of the bays are really secluded but got a bit eerie when I had to go around the cliff edge of a cemetry (nice place to be buried though I guess). On a lighter note, Coogee has some great places to eat. I've discovered Melonheads which is all fruit and natural stuff (they do the best smoothies, pineapple, ham rolls and mango/strawberry yoghurts) and Cozzie Cafe which does the best Latte and serve gluten free toast for brekkie! 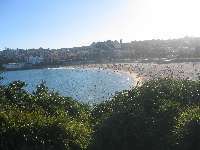 It seems Bondai and Coogee have swapped personalities according to other peoples recolections of both beaches. Coogee is now packed with people and Bondai a bit quieter (in my opinion). I quite like Bondai I think (well I am 33 now!). Caught up with Julian again before his trip to Brisbane then back home to Yakky Dah land and spent the rest of the time on the beach or reading back at the apartment. The weather has been lovely and hot but had a couple of storms and it's rained today so good job I'm about to embark on my journed up the coast tomorrow! Bye bye until my next post from oop north.